Every country around the world can take a lesson from Sweden, a country with a recycling program so far ahead it runs out of waste for its recycling program and has had to import it from other countries. A shocking less than 1 percent of household waste in Sweden was sent to landfills since 2011. Taking that concept even further, Swedish municipalities are investing in futuristic waste collection techniques. These include a type of automated vacuum system for use on residential blocks, and underground container systems, said Hazel Sheffield from The Atlantic. The country’s waste goes into a nation-wide heating network in an efficient over-arching energy recycling system. “Swedish people are quite keen on being out in nature and they are aware of what we need to do on nature and environmental issues,” says Anna-Carin Gripwall, Director of Communications for the Swedish Waste Management’s Recycling Association. As the most foliage-dense large city in the United States, Houston could stand to be more conscious about its waste to honor the beautiful greenery we have at our fingertips. Residents who spend time in city parks and other outdoor areas want to see less waste left behind. What can Houston learn from Sweden? If we want to see our recycling and energy systems begin to shift toward zero-waste as Sweden has exemplified, a massive culture change will need to take place. Currently, there are several organizations such as the Texas Campaign for the Environment, Go Green Community and Green Houston that are actively working to increase recycling programs in the city. Though most large businesses in the area have recycling systems set up, we have a long way to go before recycling is seen as a major practice in Houston. A culture shift would require consistent communications from city officials and an applied recycling practice all Houston neighborhoods can follow regularly. Houston residents say that the city’s recycling could be more streamlined. Building regulations should require that all businesses have designated bins for recycling, composting and waste materials. If resident are encouraged to recycle in business places, there would be a collective consciousness for recycling in homes, schools and all across the city. What is your experience with recycling in public and in private? Share your thoughts with us on how Houston can improve! Public art projects located in metropolitan areas can revitalize areas that were once neglected by traditional re-development efforts. The City of Houston is home to an abundance of commissioned public art projects, including Anthony Shumate’s Monumental Moments – located in Buffalo Bayou Park and Margo Sawyer’s Synchronicity of Color located in Discovery Green. Murals, installations and interactive pieces encourage community gathering and engagement in the public arenas that attract large numbers of people. Community is important because it gives us a sense of belonging and values to grasp firmly to. From community strength and effort, the most notable social action is born and re-generated through continuous efforts to keep community spaces alive and prospering. My challenge to the Houston art community is to create a wider platform for artists using their work to send a message about their community’s concerns. By amplifying artists of diverse backgrounds and ethnicities, we can give Houston’s civic art and engagement initiatives a broader meaning. Artwork in all mediums captures the expansiveness of human existence – mind, body and soul. It demonstrates our feelings, values and beliefs, our attitudes and reactions to the world. Producing art gives us a unique space to amplify our voices against oppression and injustice – one that is born out of an urgent desire for change. In art spaces, individual and shared experiences collide to uncover truth and tell stories that have long been suppressed. Art also makes us softer. It gives us tools to be courageous in our vulnerability and create paths for collective strength and resilience. In a world where great suffering occurs everyday, art pulls us together and brings us back to love. Creative expression provides a foundation. A community immersed in the art of its people has the energy to endure obstacles and keep moving forward. Art has an enormous capacity to influence, mobilize and heighten awareness of social injustice and community issues. By bringing the locus of social problems into the community center, public artists create a powerful force to facilitate community discussions and drive action. Traditionally, artistic expression has been one of the most predominant ways marginalized populations have chosen to engage with the political and social issues. Black feminist artists such as Carrie Mae Weems and Mikalene Thomas use their mediums to engage viewers with topics such as: violence, black femininity, mourning and strength. Weems’ 2011 public art project, Carrie Mae Weems & Social Studies 101, Operation: Activate used striking imagery and bold language to activate a campaign to stop violence and reckless police murder of young black men in Syracuse. The project culminated as a strong example of how art can be used as a potent tactic in social campaigns. Similarly, in her 2012 project, Origin of the Universe, Mikalene Thomas converts examples of female objectification into feminine agency and power. While providing spaces for community reflection and congregation, art also prods our imagination for future possibilities. It gives us visuals of what our world would look like without having to fight against society’s own destabilization. Join Vox Culture for the next installment of our 2018 Homegrown Initiative addressing the environment with, “Homegrown: Green Innovation”. We will be hosting our second event of the year at Eureka Heights Brew Co. on Thursday, March 22nd, from 6:30PM-9:00PM. Vox Culture is hosting this expo in partnership with Houstainable. Based locally, Houstainable is a new organization that seeks to build and enable the platform for clean technology entrepreneurs and sustainable capital to thrive in Houston. Together, our organizations are bringing a select group of rising Houston startups that are building and implementing new technologies to encourage local innovation and address the various environmental issues that plague Houston and the world. 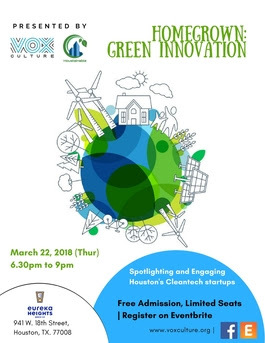 Also featured will be environment related art work created by Houston artist Johnathon Michael Espinoza – who will also talk about the possible intersection of arts and green businesses. “Homegrown: Green Innovation” is a free public event that will provide a chance for guests to directly engage, network, and show support to these businesses, while getting a sneak peak at some of the latest and up and coming technological creativity being developed to minimize negative environmental impact. A brief panel will also feature experts and founders who will talk about their inventions, and the challenges currently facing startups and proper innovation in Houston. Topics such as creativity together with how the arts can collaborate with local green technology startups to further green business and environmental initiatives will also be addressed. Beer selections from Eureka Heights will also be available for purchase by guests. Other items such as soft drinks and water will also be available, while food will be offered for purchase via onsite food trucks. Entry is free, but space is limited, so please remember to RSVP via Eventbrite. Inquiries may be directed to shen.ge@voxculture.org. Being “Green at Home” is a home practice of environmental mindfulness. In my point of view, “Going Green” is a process that involves pursuing ecological knowledge and instilling recommendations in our society. The aim is to improve current conditions while protecting and sustaining natural resources for future generations. If we are able to start making a difference in our family settings and communities, we can inspire other members of our society to make a difference as well. Green practices that start in the home transfer naturally into public arenas. In my family setting, a staple practice of our “green” efforts involves maintaining a minimalistic lifestyle. We opt to do our best to de-clutter our kitchen, bathrooms and storage areas to limit waste. We repurpose vegetable pieces, stalks, seeds and leaves to make stocks and soups. We are also financially advantaged enough to be able to buy energy efficient appliances and cleaning products. In the spring, we open the windows most days to limit air conditioning usage and save on our energy bill. Living in alignment with the “Going Green” movement at home can be very simple because you have more control over your immediate environment. Whereas, in public places the ability to recycle, reuse and save energy rests on the tools and infrastructure provided by the municipality or businesses and organizations in the area. The ability to exercise environmental mindfulness depends on living situation and household income. Making conscious choices toward the environment may be much simpler for families living above the median U.S. income. In Houston, neighborhoods in the Southwest quadrant of the city have health and environmentally conscious retailers and restaurants readily available. For someone living in the Memorial area, a Trader Joes or Whole Foods may be less than a block away from home. These retailers have policies that lean heavily toward sustainable agriculture and organic farming. Such places may increase individual awareness of “Green” practices in the community. Households with incomes below the current U.S. median may struggle implementing “Green” choices in their homes if businesses in their neighborhoods do not reflect progressive attitudes toward the environment. In neighborhoods like Sunnyside, where my family originally resided, food is more expensive and the quality is poor. In order to give her children nutritious meals, my great grandmother would trek across town to other grocery stores. A commute such as that is a time constraint that few would be willing to spare, especially if more pressing financial or health concerns limit time and mental space for creating new habits. The matter of awareness is key when we think about how folks “Go Green” at home. If your neighborhood has no regulations on recycling, it is not likely going to be a priority that comes to mind. We also have to consider what resources are available in different areas of Houston. What knowledge is accessible to people of different backgrounds? Knowledge and increased public awareness can drive change in a positive direction. Make a project of starting your own “Green” initiatives at home and watch as your changed attitudes and habits spread further!